You've come to the right place for information about jalapeno poppers. We absolutely love them. What is a Jalapeno Popper? Jalapeno Poppers are extremely popular snacks made by stuffing a hollowed out jalapeno pepper with something delicious that will fit inside the pepper. It is then typically breaded or wrapped in bacon, and then baked, grilled, or fried, then served as an appetizer, snack, meal, or dessert, depending on where you're from or how much you like jalapeno peppers. 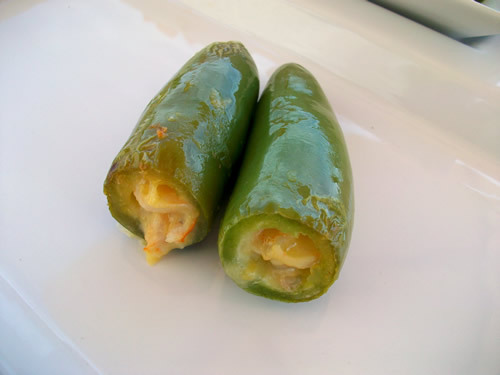 The typical way to make jalapeno poppers is to slice off the top of a jalapeno, and then remove the pepper innards with either a thin knife or a pepper corer. Common recipes call for stuffing the pepper with cream cheese or a mixture involving cream cheese, although you can pretty much stuff your jalapeno pepper with anything. Don't believe us? We've created a cookbook with over 100 jalapeno poppers and stuffed chili peppers recipes and they're all delicious. Seriously, with jalapeno poppers you can get creative. After stuffing the jalapeno peppers with your preferred stuffing, they are typically breaded and then cooked. You don't have to bread them, as the photo above demonstrates. Cooking methods vary but traditionally involve baking, grilling, or frying. See below.